Karen grew up in the Colonie area and is a graduate of the Samaritan Hospital School of Nursing class of 2008. She took her first job as a Registered Professional Nurse on the Cardiology Unit at Albany Medical Center where she worked for 5 years and was able to obtain her Bachelor’s of Nursing through Excelsior College while working full time. After completing her Bachelor’s she transferred to the Post-Anesthesia Care Unit (PACU) to broaden her expertise and increase her knowledge in the acute care population where she provided post-operative care to pediatric and adult patients over the next 5 years. While in the PACU she started her Master’s Degree and completed her Nurse Practitioner in Family Health with board certification in 2017. 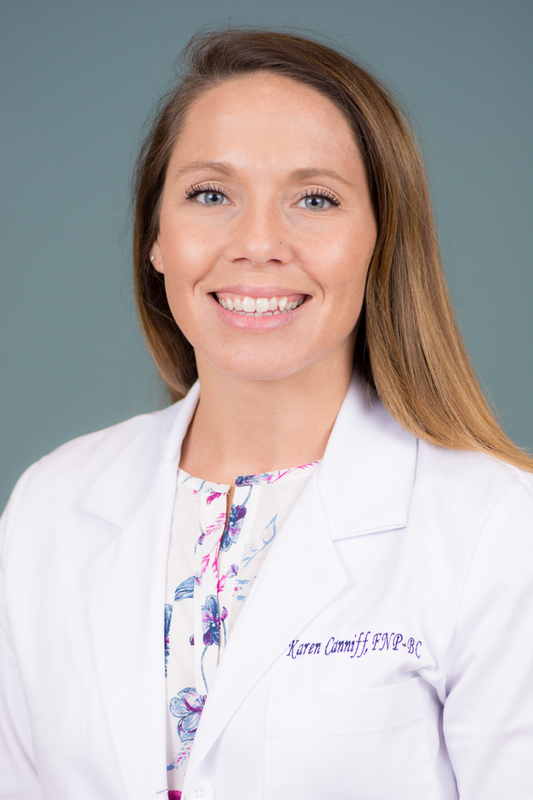 Karen was eager to get back to her passion for cardiology by accepting a position as a Nurse Practitioner with Capital Cardiology Associates in 2017. She sees patients at Albany Medical Center, St. Peter’s Hospital, and the Enhanced Cardiac Access in the Southwoods office. Karen is a member of the American Association of Nurse Practitioners as well as the New York State Nurse Practitioner Association. She is board certified through the American Nurses Credentialing Center as a Family Nurse Practitioner. When she isn’t caring for the cardiac population she spends her time with her husband and daughter. She is an avid runner, maintains an active lifestyle, and enjoys traveling with her family.